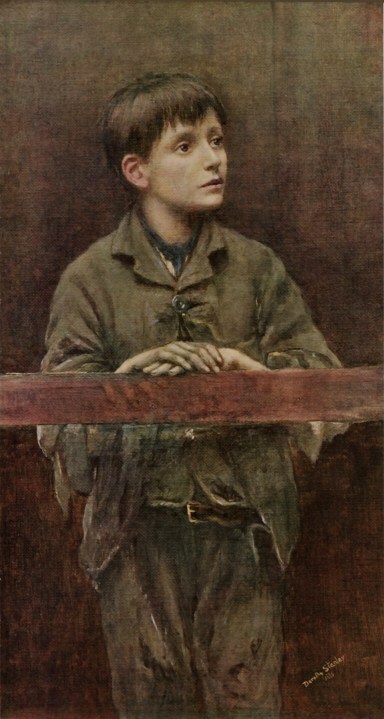 His First Offence by Lady Stanley (Dorothy Tennant). Visit Garden of Praise for a detailed description of this painting. I first read about Henry Stanley's wife's paintings in the explorers biography - a great read - and was interested in seeing what sort of artist she was. I then came across "His First Offence" and must admit to being captivated by it at first glance. My heart went out to the young boy at once and I just longed to be able to give him a warm hug and to protect him. I absolutely agree with David of Perth (I am also in Perth) that there is no shiftyness in his look, just one of being lost and of incomprehension. I am so pleased to learn that he was helped and supported by Mr Mrs Stanley and found a better life in the US. The painting is, to me, quite brilliant and will be a favourite from now on. Is there any possibility of purchasing a print? I am proud to say that the young boy, sitting for Lady Stanley, was my great uncle, Stephen Shoosmith. He sat for Lady Stanley on several occasions, and was a favourite of hers. She wrote that he was a restless subject, eager to get back to his job of selling newspapers. He emigrated to the USA, where he settled in New Jersey, founding his own publishing company. His passage, on the SS Olympic, and his entry was sponsored by Lady and Sir Stanley. My American cousins still have the original paperwork to support it. It makes me proud to read the positive comments regarding what is a beautiful painting. For those who are fortunate to have the prints, I hope that you enjoy them for many more years to come. My name is David I am a retired UK qualified GP living in Perth WA. 35 years ago I found a pictuer of 'His First Offence' in a very mixed content second hand shop. The face of the young subject captured me and the emotional was powerful. The picture is a print, of course, but well done. I do not agree with the description of there being any shiftyness in his expression, rather one of innocent confusion in a non supporting world. Such expressions are easily seen today. I have given it to an art appreciating friend, for my wife is too disturbed by the loneliness of the painting. I hope to see the Original in the Tate library one day. Meantime I am most grateful for the detail of Dorothy Stanley's works and the details of the origins of this graphic gem. Hi My name is Caroline..I searched for this picture on the internet by the artist's name..My boyfriend found it at an auction..he bought it for the frame and later looked at the picture and we decided to keep it..The expression is priceless..Such good work..Could you tell me something about it please..Thank you.